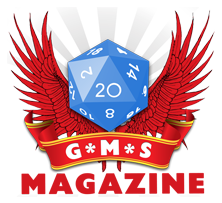 This pdf from Super Genius Gamesis 14 pages long, 1 page SRD and credits, 2/3 of a page front cover, leaving 12 1/3 pages of content fort the martial archetypes, so let’s check them out, shall we? 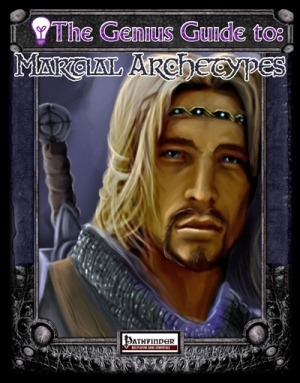 The basic concept of archetypes is explained in the first 4 ½ pages, after which we delve into the martial archetypes. The first archetype we’re introduced to is the Blacksnake, a whip specialist (who may via a sidebar be converted into a cloak-fighting specialist) who not only makes whips a viable choice for a weapon, but via the ability to deal lethal damage as well as a selection of 8 special whip talents, for an interesting specialist fighter for those of you rather into smart and tricky fighting. The Harrier is an interesting idea per se – a fighter centered on mobility and smart usage of the terrain. While a good idea on paper, the execution of this rather complex archetype is rather clunky, depending on the tracking of raid tokens which the player and DM have to track. There should be a more elegant way to represent such a mechanic in rules. Next up is the physical exemplar, a paragon of health and physical prowess gets attribute-bonuses and physical feats to reflect an above-average physical condition. While general and easy to implement, I consider this one to be rather bland and boring. The Spellhammer gets the ability to convert spell-levels into additional, scaling levels of damage. Due to Archon, Vanguard and of course Magus I don’t really see the necessity for this particular archetype. It feels like a very rough and tumble spell-burn approach. Weapon Champions devote themselves to a kind of weapon, gaining additional bonuses to e.g. CMDs, threat-ranges etc. Ok, but again, rather boring in execution. The final archetype we get is the Youxia, a type of fighter who gains access to Ki-points and talents (13 of the former are provided) – while I did like the concept of the Youxia, I would have loved to see more talents to choose from or a different take, as it felt more like a PrC or a set of classes to me. The pdf closes with archetype-packages for base-classes by SGG. Editing and formatting are top-notch, I didn’t notice any glitches. Layout adheres to the 3-column-standard and the full-color-artworks are fair. Unfortunately, the pdf offers no bookmarks, but at this length that’s still ok. All in all, this pdf left me underwhelmed, especially in direct contrast to the other installments of the series: While it provides easy to implement archetypes that may find places in almost any campaign, the archetypes didn’t manage to walk the tight line and rather fell on the side of being bland or mechanically clunky. While the blacksnake makes for an interesting take on the lasher, it’s not enough to warrant a recommendation of a file that lacks the elegant design of the other SGG-archetype-books. While the more generalist archetypes are ok, I feel that the spellhammer is superfluous at best and mechanically not too smart. In the end, the book is simply not a captivating or necessary resource and lacks the eureka-effect, the ingenious design, the elegance of the other installments. The Spellhammer’s mechanics didn’t feel balanced to me and, as I mentioned, rather superfluous. The general archetypes feel too general, the special ones rather narrow in focus or like PrCs and not archetypes. Thus, my final verdict will be 2.5 stars, rounded down to 2.